It’s that time of the year again… a season of joy, giving and great food! We hope you stay healthy and safe this holiday season and we also wish you all the very best for 2015. We will continue to provide you with our insights into the real estate market each month and we hope this information is useful and illuminating. Your thoughts and comments are always appreciated. As to the current market conditions, while the market seems to be slowing, we are still seeing properties sell within days and for very strong prices in most communities. As has been the case all year and in just about every community in which we trade, properties that are well maintained, reasonably updated and intelligently priced sell quickly and for 99-102% of the asking price. There are, of course, some exceptions. It is our expectation that a strong market will emerge – a more balanced market than we saw last year but still slightly more weighted towards the seller due to a continued shortage of inventory in most communities. What does this mean for our buyers and sellers? It means that for serious buyers, you will need to be aware of new listings the day they are listed and you will need your Buyer Specialist to have an extremely good handle on the market. Make sure you have met with your Buyer Specialist to review your criteria. For sellers, you will need to pay particular attention to the condition of your home and price it sharply. Our Listing Team will know exactly what needs to be done and will take you through the steps to ensure you are ready to go. Our clients will be well prepared for the 2015 market and as always, we will provide a service that is not just the best, but remarkable! Provided inventory levels are strong, we expect to see level pricing in most communities with the exception of Hamilton Centre, Grimsby and Stoney Creek, all of which are communities that will be affected by GO Train development over the coming years. Access to public transportation is often the key to a community’s growth. If you have any questions, please do not hesitate to contact us. It would be our pleasure to assist you! Comments Off on Looking Forward to 2015! We would like to send a very big thank you to the Burlington community for making Rocca Sisters & Associates the #1 Sales Team in Burlington once again for the 5th consecutive year (2010-2014). We are also proud to announce we have been ranked the #3 Team in all of Canada for Royal LePage (2014) for the second consecutive year! We are excited to welcome 2015 with another year of accomplishments to reflect on and an eventful year ahead. Our Royal LePage National Sales Rankings have been released for 2014 and for the fifth consecutive year, Rocca Sisters & Associates have been ranked #1 in sales production and volume among all Royal LePage agents in the Burlington and surrounding area. We were also ranked #3 nationally for Royal LePage out of the approximately 14,500 sales representatives across the country. This is a true honour, and all of us here at Rocca Sisters & Associates are both excited and appreciative to have concluded another incredibly successful year. The year ahead will bring us many more opportunities to do what we love and that is helping people in our community. In our recent Rocca Sisters & Associates 2015 planning meeting, we discussed what our visions are as a team for our community and our clients. How many families are we going to help this year? What community events will we proudly sponsor? These are all things that will make the difference in 2015, and this is what we look forward to. What sets us apart from many other professionals is our ability to embrace change at many different levels. Change is the one constant and continually refining of our client systems is essential to meet our clients’ expectations that define the experience overall. In the year ahead, we will continue to be innovators in the industry and provide all of our clients with an experience that is not just the best, but remarkable. A special thank you to all of our clients for your support and referrals throughout 2014. It is your support that continues to drive our success and invites others to experience firsthand our unique and genuine hands on family focused approach to buying and selling. Our relationships truly recommend us as the majority of our business is done with repeat clients and referrals to their family and friends. We look forward to serving you, your family and your friends in 2015. From our family to yours, we wish you a happy and healthy holiday season and a prosperous New Year. When it’s chilly out, one would probably rather sit by the fire than go to open houses. One may even think the effort isn’t worth it because winter’s a bad time to buy. But there are pros and cons to house hunting in any season. Home buyers, shouldn’t be quick to pause their searches when the snow starts to fall, especially when current housing inventories are very low compared to demand. Compared to the busier spring and summer seasons, home buyers face less competition from all-cash and investor buyers during winter. First-time home buyers are pushed out of the housing market because they can’t compete with higher bidders during warmer months. But, during winter, these house hunters are more likely to find the perfect pad. With less competition for homes, sellers may be willing to come down in price as well. Additionally, sellers can’t hide certain problems during winter – like whether the furnace works. One can also tell how well the gutters work by checking for icicles hanging from the house or ice puddles on walkways. Once snow has fallen, it becomes difficult to tell what the yard is really like. One may not realize there’s a slope to the yard or that there’s a large garden area when it’s covered. The coloring of the season can also make the area seem bleak or unattractive. However, home buyers just need to use a little imagination to remember the trees will have leaves and the grass will be green again soon. The snow also hinders getting a true assessment of the size and borders of the land, which can be an issue if plot lines are in dispute. Additionally, moving in winter can be a pain. The snowy and icy conditions can make it difficult to drive a moving truck and carry boxes safely to and from the houses. Curb Appeal – The exterior beauty of your home shouldn’t fade with the onset of the cooler weather. 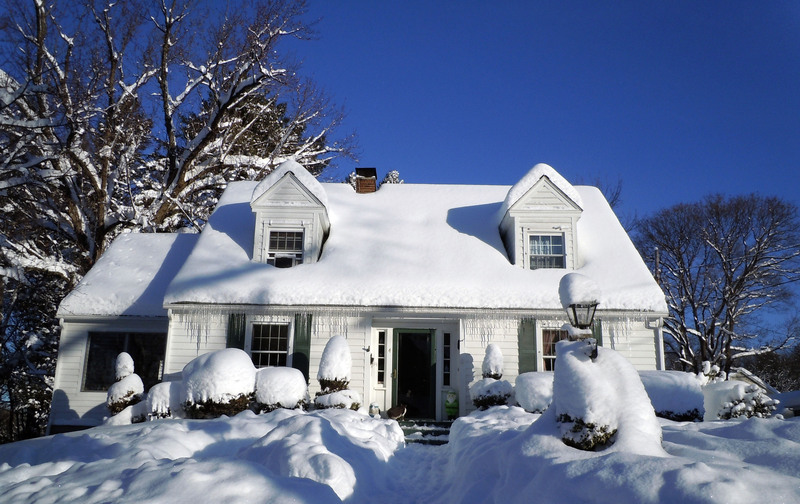 Curb appeal is always a crucial aspect of attracting buyers, even during the winter. Keep trees and shrubs neatly trimmed and remove all leaves and debris. Always keep your driveway and walkways cleared of snow and ice. Add colour and visual interest through the use of outdoor urns or planters full of winter greens, branches and rustic decorative touches perfect for the season such as pinecones. Make sure your windows and floors are sparkling clean and you have a nice mat available for buyers to take their shoes off during viewings. Replace Old Fixtures & Appliances –With less sunlight during the winter, it’s important to replace dated light fixtures and to add as much ambient lighting as possible. You should also change old faucets and showerheads and replace your exhausted appliances. A home’s value can begin to decline in the buyer’s mind once they begin calculating the cost of replacing old, outdated appliances. Make sure your home is de-cluttered and spotless – Home buyers need to envision themselves living in your home. To achieve this you need to remove clutter and depersonalize your living space. Remove family photos and keep your decor neutral, however you still want your home to exude warmth, especially in the winter. Turn on your fireplace to add a cozy ambiance. Strategically placing blankets and throws can also help set a warm, comfortable tone for buyers. You should also check the temperature of your home. You want the temperature to be comfortable on cold days to make your home welcoming and give potential buyers a reason to linger. Properly staging your home is proven to make a dramatic difference in both sale price and the number of days a home is on the market. This is why each of our listings receives free home staging by a professional stager whether it’s spring, summer, winter or fall. We are designated Accredited Staging Professionals and the trademarked owners of the powerful STAGED & SOLD brand. We will ensure your home is staged properly to showcase the best it has to offer a potential buyer. For more tips or to schedule a free, no obligation home evaluation please contact us at 905-335-4102 or email us at info@roccasisters.ca. Our personal approach and proven results will surpass your expectations!